This area has been occupied for more than ten thousand years. The First Peoples settled in villages on extensive lands that would evolve over thousands of years into San Francisco Bay. At least 50 tribes with eight linguistic traditions had distinctive tribal names, with their own leaders, languages, customs and territories. The Ohlone tribelet in this area was called Puichon. They actively managed an environment abundant with water, plants, trees, grasses and animals. Resources were used with care and appreciation so they would continue to be available. Little or nothing was wasted. One harvest followed another in a great yearly rhythmic cycle. When the grandparents of the most influential rancho owners in our area– Juan de Prado Mesa and Juana Briones de Miranda–walked north as children with the DeAnza Expedition in 1776, their world was controlled by the Spanish military and the Franciscan friars, as Alta California was a frontier outpost to be defended and Christianized. A series of missions were built, including Mission Santa Clara de Asis in the valley known then as the Llano de Los Robles, or Plain of the Oaks. Many Spaniards considered Alta California a cultural wasteland, and military officers dreaded an assignment to the presidios in Monterey or San Francisco. But it also presented an opportunity to these hardy families – a chance for land and an easier life than their impoverishment in New Spain. Over the next forty years, the Californios built their own social networks and communities, far removed from the control of the crown and church. By 1821, when Mexican independence was declared, the focus had shifted to the secular and entrepreneurial undertakings. The new government treated Alta California as a vital colony to be developed and populated by enterprising settlers. Commerce expanded with ships traversing the coast bringing goods from the east in trade for hides and tallow. The mission lands were secularized, opening up hundreds of thousands of acres to individual ownership. Vast tracts of thousands of acres were handed out left and right. The area which is now the City of Los Altos was part of Rancho San Antonio, a 4,438 acre land grant given in 1839 to Juan Prado Mesa, a soldier who commanded the presidio in San Francisco and later the guard at Mission Santa Clara. Mesa died of old wounds and with significant debts in 1845; part of his rancho, which also included portions of present-day Los Altos Hills, was sold at an executor’s sale at $.07 an acre. The greater part of the land where Los Altos Hills is situated was part of Rancho la Purissima Concepcion granted in 1840 to Jose Gorgonio and his son, Jose Ramon, Indians from Mission Santa Clara who sold it in 1844 to Juana Briones de Miranda. Two of Mesa’s sons married her daughters. Part of her adobe home stood until 2011 on Old Trace Road in Palo Alto. A section of adobe wall was saved by local citizens through The Friends of Juana and Palo Alto Stanford Heritage (PAST). By 1850, there were at most about 100 families scattered across the huge area known as los altos (“the heights”). In just one generation, Mexico would lose control of Alta California to the United States and the territory would be dramatically re-made with the frenzy of the Gold Rush. Gradually, the ranchos were divided and sold as smaller ranches for cattle grazing, orchards, and vineyards. 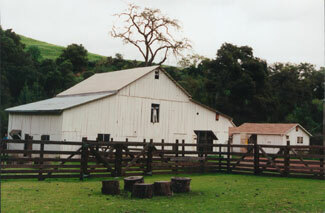 Briones sold about three quarters of her rancho in 1861 to Martin Murphy, Jr. who had come to California in 1844 in the Stephens-Townsend-Murphy Party (the first wagon train to cross the Sierra Nevada into California—two years before the Donner Party and five years before the Gold Rush). His daughter, Elizabeth Yuba Murphy (named for the Yuba River where the wagon train stopped when she was born) married William Post Taaffe, a lawyer from Boston. Her father gave her the equivalent of half of Los Altos Hills as a wedding gift. The initial development of a community called Los Altos is credited to Paul Shoup, an executive of the Southern Pacific Railroad who wanted to link the cities of Palo Alto and Los Gatos with a new rail line. But there was one problem – rifle heiress Sarah Winchester didn’t want to sell the ranch she’d bought for her sister, Isabelle Merriman, located smack dab in the middle of the route. In 1906 Isabelle was in her 60s, had twenty years of ranching under her belt and an ailing husband, but she still fought the sale. Winchester, whose attorney had interests in the rail line, was forced to relent—but she made them buy the whole ranch, for top price—not just the five acres they wanted for the line. This “extra” land enjoyed natural beauty and proximity to San Jose and Stanford University. Shoup joined with colleagues to form the Altos Land Company to buy it from Winchester. Advertising Los Altos as “the loveliest place on the peninsula,” San Franciscans were offered free railroad excursions for a day in the country, with complimentary picnics alongside the tracks where lot sales were held. By 1911 there were 50 homes in Los Altos and a few office buildings and stores on Main Street. At first, twelve steam trains a day stopped at the temporary two-boxcar railway station. By the time the architect-designed depot was finished in 1913, trains were running for the morning and evening commutes, plus the electric trolley so convenient for getting to school or shopping on California Avenue (if one could afford the 5-cent fare each way). The first business in town was Eschenbruecher’s Hardware Store, at 316 Main Street, which also housed the post office. The Los Altos Water Company, Los Altos Building and Loan, University Land Company and the railroad company all occupied offices in downtown. In 1909, the two-story Shoup Building at Main and Second streets housed a grocery store downstairs, managed by Paul’s brother-in-law Al Robinson, while upstairs one teacher taught all eight grades of the school. As Shoup envisioned, Los Altos grew and prospered. Commuters took the train to their city jobs, then back home to their elegantly rural homes. The business community thrived and ranchland gave way to tree-lined residential streets. Following World War II, as the market for land became more profitable for homes than fruit, Los Altos experienced a boom in construction and new schools were built in rapid succession to accommodate the expanding population. Leaders in Los Altos, fearing annexation by neighboring cities, realized that incorporation was one way to control zoning and development. After a bitter campaign and a very close vote, Los Altos became Santa Clara County’s 11th city on December 1, 1952—and the first since the war to incorporate. Minimum residential lot size was established at one-quarter acre. Meanwhile, in still-unincorporated Los Altos Hills, residents were becoming concerned by the zoning decisions of county planning commissioners and supervisors that threatened their treasured rural atmosphere. Homeowners banded together to fight for incorporation and the Town of Los Altos Hills became official on January 27, 1956. The new council voted to retain their minimum one acre lot size. Where are they today? Descendants of the people who have lived here over time are still with us, whether Ohlone, rancho residents, Gold Rush settlers, or post-war Boomers and incorporators. You see their names on our streets, and their descendants in our neighborhoods, reminding us that “los altos” has always been a great place to live, work and play.